After a long collaborative process of several months, the book Ciudadania y ONG (Citizenry and Nonprofits) has just seen the light. This has been a very interesting exercise of co-coordination along with Imanol Zubero, Carlos GimÃ©nez and Enrique Arnanz. I am deeply grateful to the promoters of the book, FundaciÃ³n Esplai, and, of course, to the rest of the coordinators. Scholars have fewer occasions to collaborate with people outside the Academia and higher pressure not to: being part of the book was keeping a wire attached to the power that boosts citizen movements. Besides the later, some of the many people that helped in making the book a reality are Carles Barba, MarÃ­a JesÃºs, JosÃ© Maria PÃ©rez, Maria JesÃºs Manovel, Elvira Aliaga, Virginia Pareja, Cesk Gasulla, Josechu Ferreras, Jorge Hermida, Carles Campuzano, Luis M. LÃ³pez Aranguren, Consuelo Crespo and Rafael RodrÃ­guez. PeÃ±a-LÃ³pez, I., Zubero, I., GimÃ©nez, C. & Arnanz, E. (Coords.) (2013). CiudadanÃ­a y ONG. El nuevo papel del Tercer Sector ante el cambio de Ã©poca..
PeÃ±a-LÃ³pez, I., Zubero, I., GimÃ©nez, C. & Arnanz, E. (Coords.) (2013). Ciutadania i ONG. El nou paper del Tercer Sector davant el canvi d’Ã¨poca.. Some months ago, professor in Social Pedagogy Xavier Ãšcar approached Francesc BalaguÃ© and I and told us he was very worried: after many years working in the field of community action, the Internet had come and changed every definition we had on what a community was, and changed every definition we had on what interaction (or action) was too. He had just found out that community action might be lagging behind the pace of times. And he invited us to write a book on the new communities and how did they interact on the net, so that he and his colleagues could use it to catch up with new scenario after the digital revolution. An appealing invitation as it was, we had grounded reasons not to accept it: one of us is a pedagogue specialised in instructional technology and the other one an economist specialised in the impact of ICTs and development. Thus, we knew almost nothing about community action, and only had a chaotic approach to new expressions of communities working together in the most different types of ways and goals. That is precisely the point , stated professor Ãšcar. Hence the heterodoxy of the inner structure of the book that has just seen the light. AcciÃ³n comunitaria en la red (Community action in the net) is neither a book on community action nor a book with very clear ideas. It is, but, a book that invites the reader to think, to elaborate their own conclusions, and to find out which and whether these conclusions can be applied and how to their own personal or professional cases. What were the history, motivations, goals of the community? What led the community to use the Internet? How was the community articulated digitally? what provided the Internet that could not be found offline? How was the process of adoption of digital technologies, what tools and why? What happened to the sense of membership, identity, participation? What was the role of the mediator, facilitator, leader and how does it compare with an offline leadership? Is self-regulation possible? How was conflict handled? How is digital knowledge, experiences and learning “brought back” to the offline daily life and put into practice? The cases are preceded by two introductory chapters, a first one on the social web and virtual participation, and a second on digital skills, as we thought some common background would help the reader to better understand some digital practices (and jargon). The book closes with what we, both authors, learnt during the preparation of the book and from reading other people’s chapters. This concluding chapter can be used too as a guideline for the preceding cases. 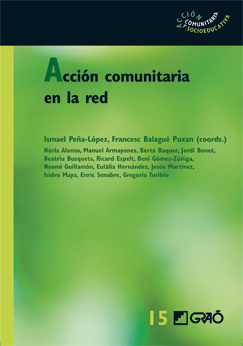 From the official page of the book AcciÃ³n comunitaria en la red at Editorial GraÃ³. Introduction, Francesc BalaguÃ©, Ismael PeÃ±a-LÃ³pez. What is the Web 2.0? New forms of participation and interaction. Francesc BalaguÃ©. Brief introduction to digital skills. Ismael PeÃ±a-LÃ³pez. APTIC. A social networking site for relativos of boys and girls with chronic diseases and conditions. Manuel Armayones, Beni GÃ³mez ZÃºÃ±iga, EulÃ lia HernÃ¡ndez, NoemÃ­ GuillamÃ³n. School building: new communities. Berta Baquer, Beatriu Busquets. Social networking sites in education. Gregorio Toribio. Networked creation and the Wikipedia community. Enric Senabre Hidalgo. Towards cyberactivism from social movements. NÃºria Alonso, Jordi Bonet. There is a lot of people to be thankful to for making the book possible. The first one is Xavier Ãšcar. I have only seldom been granted such a degree of total confidence and trust, not only in my work but in myself as a professional. He was supportive and provided guidance to two ignorants in the field. He totally gave us a blank cheque and one of my deepest fears during the whole process was — and still is — to have been able to pay him back with a quality book. I really hope it has been so. The authors of the case studies were just great. Some of us did not know each other and I can count up to three people which I still have to meet personally (i.e. offline). They also trusted in us and gave away a valuable knowledge and work that money won’t pay. Many of them won’t even make much use of adding a line on their CVs for having written a book chapter. I guess this is part of this sense of new communities that the whole book is talking about. My gratitude (but also apologies) to Antoni Garcia Porta and Sara Cardona at Editorial GraÃ³. I am fully aware that we made them suffer: we succeeded in transferring some of our chaotic lives to them when they had not asked to. Being an editor today must be both a thrilling and a difficult challenge. We all gave away time in the making of the book but the published they represent invested money too, and that is something that we quickly forget these days. Last, but absolutely not least, it has been a real pleasure working with Francesc. I think we only met once during the whole process: when Xavier invited us to coordinate the book. Francesc then packed and went around the world for 14 months. Luckily he took his laptop and would connect every now and then. Our e-mail archive and Google Documents can testify that almost everything is possible if there is the will to do it. And it was fun too. Oh, yes it was! On July 14th, 2011, I was at the University of MÃ¡laga (Spain) where I spoke at the summer course AcciÃ³n ciudadana y voluntariado en la nueva sociedad global: voluntariado y universidad (Citizen action and volunteering in the new global society: volunteering and university). My session was called Volunteering from home, the office or the train: online volunteering, social networking sites and smartphones and was preceded by an excellent conference by Luis Arancibia Tapia, where he described how society is changing and how this crisis we are suffering since 2008 is not your usual crisis, but most likely a point of no-return. That very same point — change and dire transformation of the society — is the one I used to base my speech on. Instead of providing zillions of examples of online volunteering, I tried to explain why is now possible to volunteer online, how are people behaving on the Net and what is the (different) nature of online volunteering and online citizen action. The change of framework: what has been the impact from an industrial to a digital society. The direct macro-impact of that change: how have some concepts and practices in development cooperation been radically transformed due to the digitization of information and communications. The indirect micro-impact of that change: how have some personal practices in development cooperation, volunteering and citizen activism changed, especially in the nature of their contribution to charities and non-profit initiatives. Some examples, a suggestion for a categorization and a comment on the Arab Spring. Please see below my presentation. You can also visit my bibliographic file for Volunteering from home, the office or the train: online volunteering, social networking sites and smartphones (the original title) for downloads both in English and Spanish. Peña-López, I. (2011) “Volunteering from home, the office or the train: online volunteering, social networking sites and smartphones” In ICTlogy, #94, July 2011. Barcelona: ICTlogy. Slides and references for my conference at the 6Âº Congreso Andaluz de Voluntariado (6th Andalousian Volunteering Congress) in Sevilla (Spain). I thank the invitation of Fran Santolaya, who is, with Isidro Maya, coordinator of e-Voluntas, a referent blog and discussion list about ICTs in nonprofits: online volunteering, ICT4D, etc. International Journal of Electronic Government Research, 2 (2), 1-21. Hershey: IGI Global. PeÃ±a-LÃ³pez, I. (2005). e-Learning for Development: a model. ICTlogy Working Paper Series #1. Barcelona: ICTlogy. The Journal of Information Technology in Social Change, Spring Edition – April 2007, (1), 136-152. Vashon: The Gilbert Center. Universitat Oberta de Catalunya (Ed.) (2005). Estudi dâ€™Impacte de les Titulacions UOC. (mimeo). Barcelona: UOC. Peña-López, I. (2009) “Voluntariado virtual: acciÃ³n social en la Sociedad Red” In ICTlogy, #65, February 2009. Barcelona: ICTlogy. Slides and references for my seminar at the PhD programme of the Social Psychology Department at the University of Sevilla (Spain). I thank the invitation of Isidro Maya Jariego, who is, by the way, doing a terrific work on personal and community networks. Peña-López, I. (2009) “Voluntariado virtual: e-learning para el desarrollo” In ICTlogy, #65, February 2009. Barcelona: ICTlogy. Notes from the the II Encuentro Internacional TIC para la CooperaciÃ³n al Desarrollo (Development Cooperation 2.0: II International Meeting on ICT for Development Cooperation) held in GijÃ³n, Spain, on February 10-12th, 2009. More notes on this event: cooperacion2.0_2009. More notes on this series of events: cooperacion2.0. Need for collaborative work among inst. Next stage on ICT4D: focus on KM, agenda transformation, along with dev agenda tooâ€¦ towards a Development 2.0? Debate on ICT4D largely over, but still there underneath. More evidence, models? Scale of problems are huge, but analysis helps to disaggregate in order to facilitate interventions. Demand-driven projects interventions â€“ do users have an input? Vikas Nath: Wake up call that ICT4D have to focus on the “D”. Merryl Ford: how do we know how, when and where we succeeded? How do we build the agenda? How do we reach the stage to collaborate in building together the agenda? Anriette Esterhuysen: Development is continuous, and there are new challenges and everywhere, not only in developing countries or during crises. We need knowledge management, to keep learnings in mind. And look to small initiatives with small but really effective impact. Najat Rochdi: Development 2.0 implies a huge shift, bringing in a new concept of multilateralism. We need to bring new stakeholders in. Ismael PeÃ±a-LÃ³pez: What or who are development institutions? In a world 2.0 where everyone participates, institutions are in dire crisis of identity. We should bring in not only development institutions, governments or communities to whom we address development actions, but also the citizens that can enable them in the developed world by means of ICTs. Development 2.0 is not about institutions, it’s about people in both developing and developed countries. Anriette Esterhuysen: Significant gaps in access to infrastructure makes it still difficult to link micro-to-micro levels of development cooperation. Notwithstanding, people are driven by commitment and come together to run projects. We have to let them build these projects on their own. To promote smooth evolution of projects instead of leaping from one to the other. Vikas Nath: Cooperation has to balance powers, and be made from an even and empowered point of view. Countries have to enter the cooperation landscape in a position of strength. Cooperation 2.0 is the solution to balance powers. But we’re not seeing it: giving aid is somehow legitimizing donor countries to intervene at their own will in developing countries. And we have to end that. Najat Rochdi: Cooperation 2.0 towards co-development. Ismael PeÃ±a-LÃ³pez: we have to be able to list an inventory of all the resources available (funding, natural resources, human resources, knowledge), see who’s got what, and engage in a conversation on how to better allocate and exchange these resources. ICT4D are surely about knowledge management and the transmission of knowledge, not the transmission of “atoms”. And, the more countries specialize, the more likely we are to find ICT4D is the leading issue in Development Cooperation in general, as it is knowledge unbalance what really makes development differences dire (let aside humanitarian aid for emergencies). Peña-López, I. (2009) “Development Cooperation 2.0 2009: conclusions” In ICTlogy, #65, February 2009. Barcelona: ICTlogy.